You’ll see that we have an interesting range of vintage Mens 1980s shirts in a rainbow of colours that’ll give you a perfect 1980s look, or act as an accompaniment to a contemporary outfit that incorporates all the latest trends, but adds another dimension. A classic vintage piece can really change how you look in a really positive way, with something that looks distinctive and stands out as part of an exclusive look no one else can copy. If you’re looking to recreate the 80s you couldn’t find a better vintage store to help in this goal. 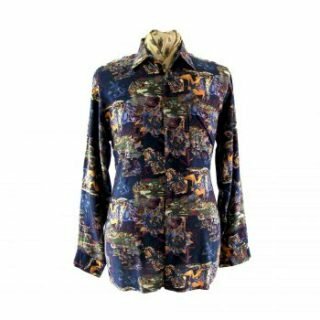 We have a wide selection of 1980s vintage shirts for you to browse, each one checked for quality so you know you’re getting something really special. Take a look around and relive the 80s your way, with stylish and unforgettable vintage 1980s shirts. With a vibrant colour palette that’s completely in tune with contemporary trends, you’ll be making waves in all the right ways.